Grass-fed Whey protein concentrate, Chicory Root Fiber, whey protein crisp (whey protein isolate, whey protein concentrate, rice flour, tapioca starch, calcium carbonate), Gluten-free Oats, Vegetable Glycerin, tapioca syrup, sugar, sunflower oil, almonds, chocolate liquor, Responsibly-Caught Fish Oil(Anchovy, Sardine, Tilapia) Cocoa Powder, Natural Flavors, cocoa butter, soy lecithin, sea salt, monk fruit extract. Allergen Statement: Contains Milk, Fish, Tree Nuts and Soy. May contains traces of peanuts. Grass-fed whey protein (whey protein concentrate, whey protein isolate), chicory root fiber, organic chocolate (unsweetened chocolate, sugar, vanilla), gluten free oats, prganic brown rice syrup, vegetable glycerin, organic coconut, organic sunflower oil, responsibly-caught deep ocean fish oil (anchovy, sardine, tilapia), almond butter, cocoa powder, natural flavors, whey minerals, seasalt, sunflower lecithin, tapioca starch, luo han fruit extract. Contains milk, fish, and tree nuts. Manufactured in a facility that processes peanuts. Grass-fed whey protein concentrate, chicory root fiber, whey protein crisp (whey protein isolate, whey protein concentrate, rice flour, tapioca starch, calcium carbonate), gluten free oats, vegetable glycerin, tapioca syrup, sugar, sunflower oil, almonds, chocolate liquor, responsibly-caught fish oil (anchovy, sardine, tilapia), cocoa powder, natural flavors, soy lecithin, sea salt, monk fruit extract. Allergen Statement: Contains milk, fish, tree nuts and soy. May contain traces of peanuts. Grass-fed Whey Protein concentrate, chicory root fiber, whey protein crisp (whey protein isolate, whey protein concentrate, rice flour, tapioca starch, calcium carbonate), peanuts, vegetable glycerin, gluten free oats, tapioca syrup, sugar, natural flavors, sunflower oil, chocolate liquor, responsibly caught fish oil (anchovy, sardine, tilapia), cocoa powder, cocoa butter, soy lecithin, almonds, sea salt, monk fruit extract. Contains Milk, Fish, Peanuts, tree nuts, and soy. Grass-fed whey protein concentrate, chicory root fiber, whey protein crisps (whey protein isolate, whey protein concentrate, rice flour, tapioca starch, calcium carbonate), gluten free oats, vegetable glycerine, almonds, tapioca syrup, sunflower oil, sugar, responsibly caught fish oil (Anchovy, Sardine, Tilapia), cocoa butter, natural Flavors, whole milk powder, non-fat dry milk powder, butterfat, soy lecithin, sea salt, monk fruit extract. Grass fed whey protein concentrate, chicory root fiber, whey protein crisp (whey protein isolate, whey protein concentrate, rice flour, tapioca starch, calcium carbonate), gluten free oats, vegetable glycerin, almonds, tapioca syrup, sunflower oil, sugar, responsibly caught fish oil (anchovy, sardine, tilapia), cocoa butter, natural flavors, raspberry, whole milk powder, nonfat dry milk powder, butterfat, soy lecithin, sea salt, monk fruit extract. Contains milk, fish, tree nuts and soy. May contain traces of peanuts. Grass-fed whey protein concentrate, chicory root fiber, whey protein crisp (whey protein isolate, whey protein concentrate, rice flour, tapioca starch, calcium carbonate), gluten free oats, raisins, vegetable glycerin, tapioca syrup, sunflower oil, responsibly-caught fish oil (anchovy, sardine, tilapia), almonds, natural flavors, blueberry, soy lecithin, sea salt, rice flour, monk fruit extract. ALLERGEN STATEMENT: Contains milk, fish, and tree nuts. Manufactured in a facility that processes peanuts and soy. Grass-Fed Whey Protein (Whey Protein Concentrate, Whey Protein Isolate), Chicory Root Fiber, Organic Chocolate (Unsweetened Chocolate, Sugar, Vanilla), Gluten-Free Oats, Organic Brown Rice Syrup, Vegetable Glycerin, Organic Sunflower Oil, Almond Butter, Responsibly-Caught Deep Ocean Fish Oil (Anchovy, Sardine, Tilapia), Cocoa Powder, Natural Flavors, Whey Minerals, Sea Salt, Sunflower Lecithin, Tapioca Starch, Luo Han Fruit Extract. Grass-Fed Whey Protein (Whey Protein Concentrate, Whey Protein Isolate), Chicory Root Fiber, Gluten-Free Oats, Organic Dark Chocolate (Organic Sugar, Organic Chocolate Liquor, Organic Cocoa Butter, Organic Soy Lecithin, Organic Vanilla), Organic Brown Rice Syrup, Vegetable Glycerin, Coconut, Organic Sunflower Oil, Almond Butter, Responsibly-Caught Fish Oil (Anchovy, Sardine, Tilapia), Cocoa Powder, Natural Flavors, Sea Salt, Sunflower Lecithin, Tapioca Starch, Monk Fruit Extract. ALLERGEN STATEMENT: Contains milk, fish, almonds, coconut and soy. May contain traces of peanuts and macadamia nuts. BoundlessCrunch™ Whey Protein [whey protein crisps (whey protein isolate, whey protein concentrate, tapioca starch), whey protein concentrate (rBGH-free)], orgaic brown rice syrup, organic oats, organic dark chocolate (organic sugar, organic chocolate liquor, organic cocoa butter, organic vanilla), inulin (chicory root fiber), vegetable glyceine, molecularly distilled fish oil (anchovy, sardine, tilapia gelatin), organic sunflower oil, almond butter, natural flavors, natural cocoa powder, milk minerals, antioxidant blend (green tea extract, lo han fruit extract, natural vitamin E), non-GMO soy lecithin, and sea salt. Contains milk, fish and nuts. 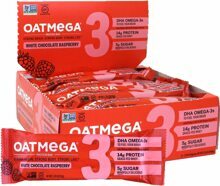 Manufactured in a facility that processed eggs, peanuts, treenuts, soy, fish and wheat. Grass-Fed Whey Protein (Whey Protein Concentrate, Whey Protein Isolate), Chicory Root Fiber, Organic Dark Chocolate (Organic Sugar, Organic Chocolate Liquor, Organic Cocoa Butter, Organic Soy Lecithin, Organic Vanilla), Gluten-Free Oats, Peanuts, Vegetable Glycerin, Organic Brown Rice Syrup, Organic Sunflower Oil, Responsibly-Caught Fish Oil (Anchovy, Sardine, Tilapia), Peanut Butter, Cocoa Powder, Natural Flavors, Sea Salt, Sunflower Lecithin, Tapioca Starch, Monk Fruit Extract. ALLERGEN STATEMENT: Contains milk, fish, peanuts and soy. May contain traces of almonds, coconuts and macadamia nuts. Allergen Statement: Contains milk, fish and tree nuts. Manufactured in a facility that processes peanuts. Grass-fed whey protein (whey protein concentrate, whey protein isolate), chicory root fiber, gluten-free oats, white chocolate (sugar, cocoa butter, vanilla), vegetable glycerin, organic brown rice syrup, organic sunflower oil, almonds, responsibly-caught deep ocean fish oil (anchovy, sardine, tilapia), almond butter, chia seeds, natural flavors, whey minerals, lemon extract, sea salt, sunflower lecithin, tapioca starch, luo han fruit extract. Grass-Fed whey protein (whey protein concentrate, whey protein isolate), chicory root fiber, gluten-free oats, white chocolate (sugar, cocoa butter, vanilla), organic brown rice syrup, vegetable glycerin, organic sunflower oil, almonds, almond butter, responsibly-caught deep ocean fish oil (anchovy, sardine, tilapia), natural flavors, whey minerals, sea salt, sunflower lecithin, tapioca starch, luo han fruit extract. Grass-fed whey protein (whey protein concentrate, whey protein isolate), chicory root fiber, gluten-free oats, white chocolate (sugar, cocoa butter, vanilla), vegetable glycerin, organic brown rice syrup, organic sunflower oil, almonds, responsibly-caught deep ocean fish (anchovy, sardine, tilapia), almond butter, natural flavors, raspberries, whey minerals, sea salt, sunflower lecithin, tapioca starch, luo han fruit extract. Grass-fed whey protein concentrate, chicory root fiber, whey protein crisp (whey protein isolate, whey protein concentrate, rice flower, tapioca starch, calcium carbonate), gluten free oats, raisins, vegetable glycerin, tapioca syrup, sunflower oil, responsibly-caught fish oil (anchovy, sardine, tilapia), almonds, natural flavors, blueberry, soy lecithin, sea salt, rice flour, monk fruit. 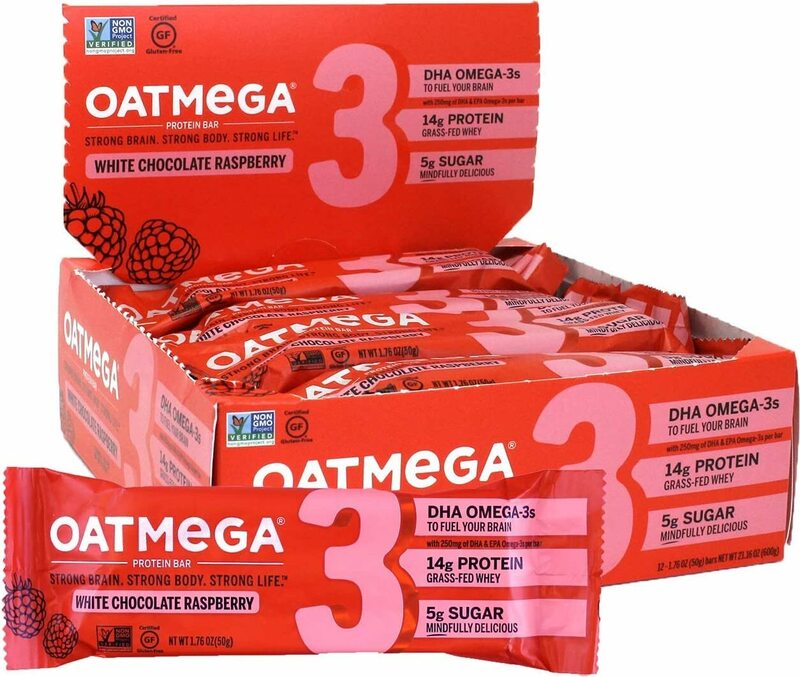 The Oatmega Bar is the "sweetest" way to get fish oil!